This is my first post and request for help. I am talking to Marco Danelli about having a reproduction of the George Washington Battle Sword (green hilted cuttoe/hanger). I'm struggling to find any specifications of the sword aside from 36" overall length and 30" blade length. If anyone has knowledge of the sword's weight, blade width, blade spine width near handle and near the tip I would be immensely grateful. I have contacted the Smithsonian but no response so far. You might reach out to Kyle Willyard at Old Dominion Forge - he made a pretty good copy of one and may have specs for the original (or ideas about it). My copy of THE AMERICAN SWORD 1775-1945, by Harold L. Peterson, includes a description of this sword. It provides the same blade and sword lengths as in your post, and also states that the blade is 1 1/16 inch wide at the hilt. It is tough to gauge the third dimension from profile or pictures of a profile. If there were an outline for blade cross sections, it would be a general philosophy. Bade thickness in the 8mm-10mm at the guard. Reducing thickness drastically in the first few inches to the center of gravity, say 4mm-5mm. Then a linear distal to the pointy end. Many reduce to quite thin at the point in the last inches. If the Washington sword blade has a false edge to the blade, that is another section to consider. A good many swords of any type often have a cog at about a third of the overall length. The Washington sword with that length and light hilt certainly loos like it would be about that range. The Washington sword type is not uncommon at all and these blades have a fairly stiff point, so leaving a bit more meat to the point. The fuller going to just before the point, which offsets weight that otherwise be ground off on blades with fullers ending a quarter or third back. Honestly, if one looks at auction pictures, one can get a pretty good look at blade cross sections. 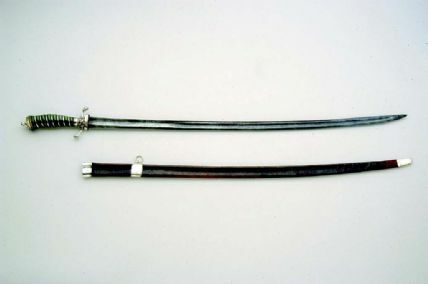 The radical concave distal putting mass towards the hand is very common to a broad variety of swords ranging from very narrow small swords to larger sabres. I happen to have a very near copy of Washington's sword for sale except this is an original (not reproduction). Bought it several years ago but even then it was a little extraneous to my main area of interest. The hilt is sterling silver with a silver rain cap and the grip is green leather rather than horn. Everything tight and attractive. Scabbard is complete and there are two rings for support so a holder from Godwin would very easily be used. It is a very attractive sword. Could use some light maintenance, oiling, etc. I have it for sale if you are interested. Email me at gosborne@evlag.com if you want pics.